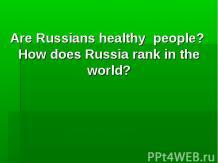 Are Russians healthy people? How does Russia rank in the world? Would you like to be healthy? Young people. What are they like? Life expectancy in different countries of the world Sweden- 81 men-78 women-83 The USA- 78 men-75 women-81 Great Britain- 79 men-76 women-81 Russia-67 men-61.5 women-74 In Russia women live 11years less than in Japan, men live 16 years less than in Sweden! Infant mortality Infant mortality is defined as the number of infant deaths (one year of age or younger) per 1000 live births. The most common cause worldwide has traditionally been due to dehydration from diarrhea. Infant mortality. Russia ranks 81st in the world in Infant mortality , between Belize and Mexico. About 16 children per each 1000 children die. The reasons of this situation are negative influence of environment, drug and alcohol addiction of parents, poor diets, poor medical service, etc. Cancer. The main reasons of cancer are surplus (избыток) of salt, malnutrition, shortage of vitamins etc. AIDS/HIV. AIDS - acquired immune deficiency syndrome or acquired immunodeficiency syndrome is a disease of the human immune system caused by the human immunodeficiency virus (HIV). Что ты знаешь об Америке?